39. Ghostly Peeps Brownie Smores: I made these for a LifeGroup hangout last week. They are really good. Realllllly rich, but good. The only thing I did different than the recipe is that I used two boxes of brownie mix instead of one. I don’t like when the brownies are too thin. 🙂 Also, one tip on broiling the Peeps…I made the mistake of putting the broiler on high and ruined the first attempt. Fortunately, I had enough extra to give it another go. I put the broiler on low and left the oven door cracked. Worked like a charm. 38. Pumpkin Cream Cheese Icing: I used this chocolate cupcake recipe with the pumpkin cream cheese icing. They were really good. Not as “pumpkin-y” as I expected, but still really good. I’d definitely make it again. 36. Melt in Your Mouth Chicken: Saw this on Pinterest and everyone was raving about it. It was ok, but I don’t know that I’ll make it again. 35. Chick-fil-A Sauce: I didn’t think this tasted like Chick-fil-A sauce, but it was definitely a good honey mustard. I’d make it again if I was looking for a honey mustard dipping sauce. 34. Chick-fil-A Nuggets: These were pretty good! And I was able to eat them as leftovers for a couple of days. 33. Halloween Brownies: Super easy. Super good! I was skeptical about the one box of brownie mix because I always feel like they get dry during baking, but these were great! 32. Pumpkin Coffee Cake: As the blogger suggested, I doubled the crumble topping on this. I didn’t really like the consistency of the “cake” part of it though. It tasted just fine, but the cake seemed really dense to me. 31. Oatmeal Sandwich Cookies with Creamy Peanut Butter Filling: These were really good, but for some reason my cookies didn’t bake flat like hers did. That made them a little difficult to eat in “sandwich” form. 30. Easy Pancakes: I wanted pancakes this morning but didn’t have any milk. Most recipes call for milk, so I did a quick search for one without. This definitely satisfied my need for pancakes, but I’d only make them again if milk were in short supply. 29. Red Velvet Sheet Cake with Nutella Frosting: I made this for an event at work and it was ok. I didn’t think it was anything spectacular, but it wasn’t awful either. I probably won’t make this again. *28. Cake Batter Bars: YUM! Also made these for a party at work. They were really good…kind of like blondies. I will definitely keep this recipe in the back of my mind when I need a quick and easy dessert. *27. O’Carrs Copycat Chicken Salad: A few years ago, I traveled to Birmingham, AL where I was introduced to O’Carr’s. They have the most amazing chicken salad, and they make wonderful cheesecake that they serve warm! When I saw this recipe show up in my Pinterest feed, I knew I had to try it. It’s as close to the chicken salad at O’Carr’s that I can remember. I can’t even remember how many times I’ve made this since I first tried the recipe. So good! 26. Upside Down Key Lime Pie Cupcakes: I was excited about this recipe because of the graham cracker frosting–just sounded fun and interesting. The cake was a little too tangy for my liking and also pretty crumby (because of the cake flour in the recipe). The concept still intrigues me, so I might stay on the lookout for a different variation of this recipe. 25. Red Velvet Cookies: Blah. I made these for an event at work and everyone seemed to enjoy them. I didn’t think they were anything special. They were definitely quick and easy to make, but I probably won’t make them again. It’s hard to believe, but in 42 short days, I’ll be boarding a plane for an exciting adventure in Africa. Along with a few others from my church, I’ve been given the incredible opportunity to travel with my mentors, Dr. Mark and Pam Kuhl, to Kenya from July 26-August 5. We will partner with Kenya Relief (http://www.kenyarelief.org), an organization founded in 2003 with the mission of living out “pure and undefiled religion” which is “caring for widows and orphans in their distress.” They are about creating a legacy of hope in the country of Kenya, meeting the needs of the whole person (body, mind, and spirit). I would encourage you to go to their website and look around in order to get a feel for the heart and scope of their ministry. 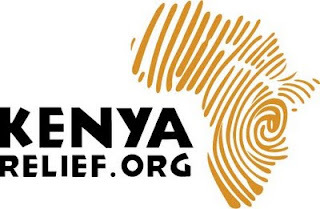 Mark and Pam have been working with Kenya Relief for several years and they truly trust the organization’s heart to serve the people of Kenya. While in Kenya, we will proclaim the gospel of Jesus Christ in both word and deed, engaging in a variety of activities that will impact the lives of those we encounter, infuse with energy the efforts of the full-time missionaries, and aid in the spiritual growth of each team member. For example, we will provide basic healthcare services (such as dental care), lead a Vacation Bible School, teach the Scriptures in a local jail, care for orphans, and work to improve the facilities of the Kenya Relief organization. Prayer Partner: Simply reply to this post and let me know that you’ll be praying. We’ll be glad to send a list of specific prayer requests so that you can join us in asking God to be at the center of this endeavor. We also plan to provide updates while we’re there, so I’ll be sure you have website information to keep up with the trip. Financial Partner: If you’d like to give online, visit http://redeemer.freehostingcloud.com (as a warning: the site isn’t fancy, but it’s legitimate and will serve its purpose). If you’re not comfortable giving online, you can send a check made payable to Redeemer Church (4064 Winter Garden-Vineland Road; Winter Garden, FL 34787). Please include a little note with the check indicating it’s for the Kenya Relief trip. I am certain that this trip will be transformational for those we serve and those of us serving together as partners on the team. I’ll be sure to follow up with you after the trip and let you know about the experience. Feel free to contact me, should you have any questions or wish to know more about this mission trip. Thank you for your support and I hope you have a wonderful summer! 24. Garlic Chicken: Made this tonight for dinner. Simple and tasty. I would make this again for sure. I used Italian seasoned bread crumbs as one reviewer suggested. Glad I did, because I’m pretty sure that’s where most of the flavor came from. 23. Key Lime Pie Sandwiches: Pinterest fail. They weren’t horrible, but they weren’t great and I wouldn’t make them again. They looked beautiful in the picture (don’t they always?!) but they didn’t look that pretty in real life! 22. 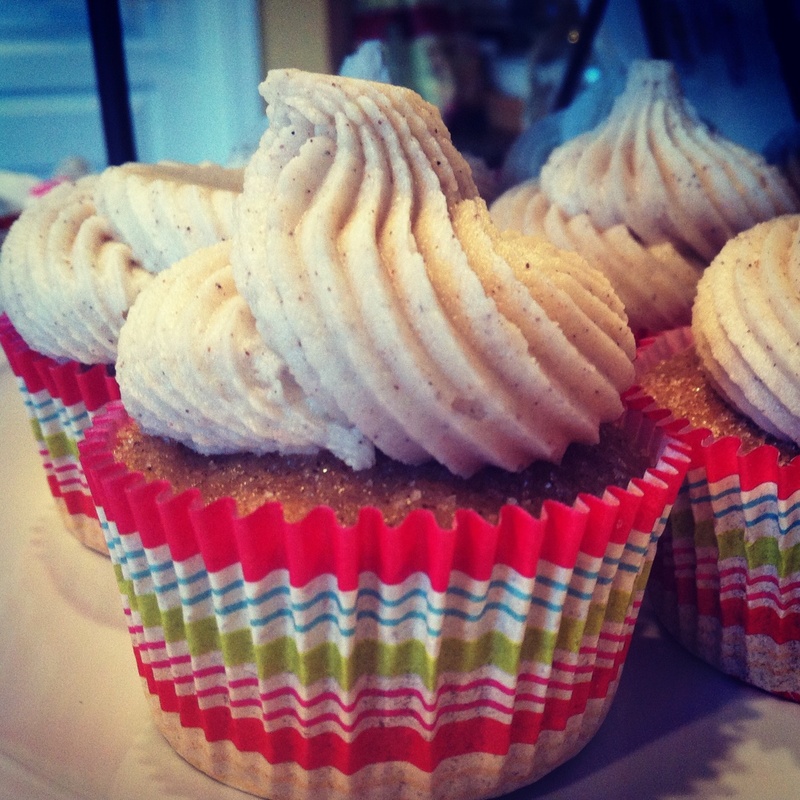 White Chocolate, Peanut Butter and Banana Cupcakes: Ummm…yum. I’ve made these twice already and they’re great. I think it’s the peanut butter icing that makes them! The flavor combination is great. The first time I made them, I couldn’t taste the white chocolate at all. So, the second time, I put about a tablespoon of batter in each cupcake cup, added 4-5 white chocolate chips and then covered that with the rest of the batter. Good idea! I could definitely detect the white chocolate taste during the second go-round. 21. Pioneer Woman’s Sangria: O.M.G. Has P-Dub ever disappointed me? Hardly ever. This sangria was SO good. I will be making it ANY TIME I have the opportunity. During the first batch I made, I inadvertently used the wrong amount of wine. And, we actually liked that batch the best! The recipe calls for 1.5 liter of red wine and 1.5 liter of white wine. During the first batch, I used two 750mL bottles of $2 wine (one white, one red) that I got from Walmart. To that I added 1 cup of orange-flavored rum and 1 cup of orange-flavored vodka (like the recipe calls for). It was delish! One piece of advice for this recipe: buy the cheap wine. The flavor is going to come from all the fruit you add. 20. Peanut Butter Filled Chocolate Cupcakes: I pinned these cupcakes and a friend subtly (or not so subtly) hinted several times that I should make them for small group. I finally had time to try them and I was a little bit disappointed. Everyone at small group said how much they loved them, but they weren’t the most spectacular thing to me. I expected the peanut butter center to be more prominent, I think. Also, I was a little bit short on powdered sugar for the icing and I accidentally thinned it out too much. I couldn’t pipe the icing on, so they weren’t as cute as they could have been. 19. Paleo Chicken Enchilada Bake: I really liked this. It felt hearty and healthy. I was the most excited about the cauliflower “rice.” I really liked it. I would make this again. 18. Disappearing Marshmallow Blondies: I didn’t have any mini marshmallows, so I made these with regular sized marshmallows that I cut into quarters. Because of that, I don’t think they were as pretty as they should have been, but let me tell you…they tasted DARN good. I took them into work and in no time flat, 3/4 of the pan was GONE! 17: Baked Mini Donuts: I made these on a whim one day just because I wanted to use the mini donut pan I got for Christmas (thanks, Mom & Dad!). They were easy enough to make, but piping the dough into the pan was kind of difficult. They tasted fine, but I think next time I’ll try another recipe. 16: Churros: I tried to make mini churros to use as decor/garnish on the churro cupcakes (below), but it didn’t go so great. The piping tips I had were either too big or too small. And the dough was REALLY hard to pipe. They tasted ok, but if I were to try them again, I’d need to get a better piping tip. 15. Churro Cupcakes: Our friends are expecting a baby boy and he’s due on May 5. We thought it only appropriate to throw a Cinco de Mayo themed baby shower in his honor. I searched long and hard for the perfect dessert. These churro cupcakes fit the bill. I kind of combined pieces of two recipes to come up with this end product and I couldn’t have been more pleased. They were a big hit with everyone at the shower. Don’t wait until Cinco de Mayo…go ahead and make these AHORA! 14. Tres Leches Cake: I made this for the same shower I mentioned with the churro cupcakes. I’d never made/had tres leches cake before, but it was definitely good. Once again, Pioneer Woman did not disappoint! 13. Peanut Butter Chocolate Chip Larabars: I buy these often and found a recipe online, so I thought I’d give them a go. I did need to add a little water, as the recipe mentions and I also added a few mini chocolate chips. Rather than make them into bars, I made them into balls. I kept them in the fridge and ate them over about a week and a half. I even think they taste better than the actual Larabar! 12. Girl Scout Cookie Tagalong Bars: Made these at the beach house and they were a hit. At first, I thought they were too rich, but since I couldn’t stop eating them I guess it’s safe to say I got over that. They didn’t last long with 6 adults (and one always-hungry two-year-old) in the house. 10. Mashed Sweet Potatoes: These were good! Definitely different than my beloved mashed potatoes, but I suppose they are healthier for you. I will be making these (or a variation of them) again. 9. Chicken Veggie Packets: This didn’t go so great. For some reason, the chicken had a difficult time getting cooked all the way through. I had to leave the packets in MUCH longer than the recipe called for. Won’t be trying these again. Our friends are expecting a baby boy and he’s due on May 5. We thought it only appropriate to throw a Cinco de Mayo themed baby shower in his honor. I searched long and hard for the perfect dessert. These churro cupcakes fit the bill. I kind of combined pieces of two recipes to come up with this end product and I couldn’t have been more pleased. Combine in small bowl and set aside. In a large bowl, or the bowl of a standing mixer, cream the butter and sugar together until light and fluffy. Add the eggs, one at a time, until just combined then stir in the vanilla and oil. Sprinkle 1/3 of the flour mixture over the butter mixture and gently stir in until barely combined. Add half of the milk, mixing until just combined. Repeat these steps with the remaining flour mixture and milk, ending with the flour. Do not over mix. Fill each cupcake tin with 2 tablespoons of batter, or until the cupcake tin is filled half way. Bake the cupcakes for 14 to 16 minutes, or until a toothpick inserted in the center comes out with one or two crumbs clinging to it. Allow the cupcakes to cool for 2 to 3 minutes, then dip the top of each cupcake into the cinnamon-sugar mixture to coat it the top of the cupcake. Allow the cupcakes to cool completely before frosting. Cream the butter and cream cheese together in a large bowl. Add the sugar, one cup at a time, beating well between each addition. Stir in the cinnamon until thoroughly combined. then stir in the vanilla. Beat the mixture well, until light and fluffy. 8. Garlic and Rosemary Roasted Chicken Bites: This was quick and simple to make. The flavor was good and I have enough left over for two more meals. I added green beans on the side. 7. Sweet Potato Chicken Casserole: I was looking for a recipe to use up several things I had around the kitchen. I used AllRecipes.com’s ingredient search and came up with this dish. I made half of what the recipe called for and ended up with enough for three meals. I left out the half and half in the recipe. I would make this again. 6. Roasted Vegetables: Saw this on Pinterest and just kind of made it up as I went. I tossed everything in some olive oil first and then baked it. I also left off the Parmesan cheese. I would definitely make this again. 4. S’mores Cups: Annnnd, another Pinterest find. These are so simple to make and super cute. Not to mention very tasty. They will definitely be added into the party treat rotation. 3. Molasses Cookies: My Mom gave me my grandmother’s recipe for molasses cookies, but they didn’t turn out quick like I’d expected. They were pretty flat, rather than fluffy. They still tasted great, but I’m going to need to give them another try. 2. General Tso’s Chicken: General Tso’s is pretty much the only thing I order when I get Chinese food. When I saw a recipe on Pinterest, I knew I needed to try it. It was not a difficult recipe, but I would probably leave out the cayenne pepper next time (at least on my pieces). The first two new recipes of the new year get rave reviews from me! 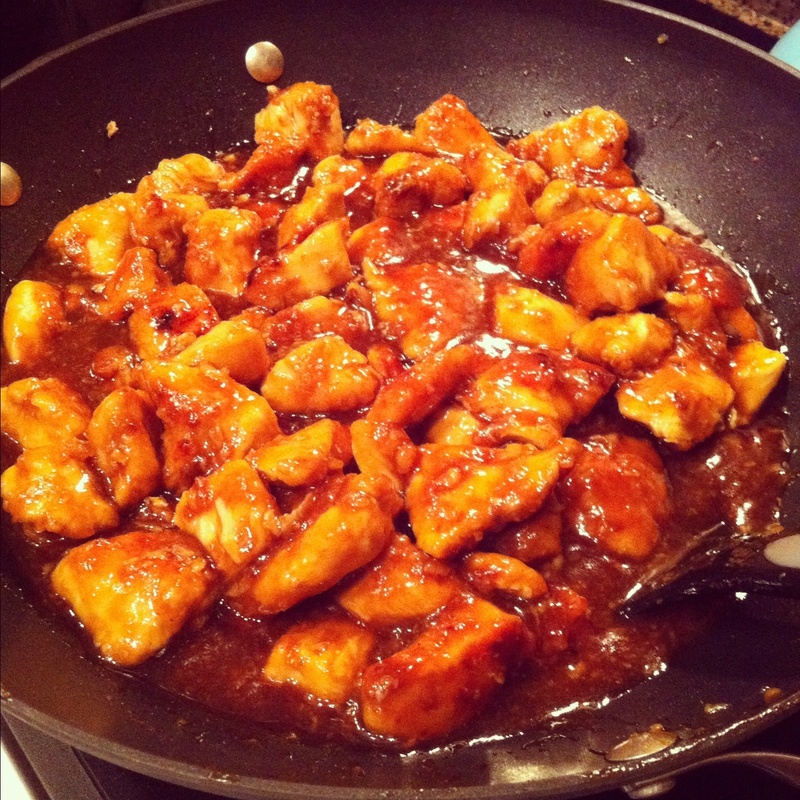 If you like General Tso’s chicken, give it a try! 1. Sticky White Rice: This went along with the General Tso’s and it was exactly what I was going for. Perfect. Here we go…the first two new recipes of the new year! General Tso’s is pretty much the only thing I order when I get Chinese food. When I saw a recipe on Pinterest, I knew I needed to try it. I was cooking for five, so we quadrupled the recipe below. (Good thing…there was enough for everyone to have what they wanted and only one leftover serving that was perfect for my lunch today.) It was not a difficult recipe, but I would probably leave out the cayenne pepper next time (at least on my pieces). The sticky white rice recipe I found was perfect and exactly what I was going for. The first two new recipes of the new year get rave reviews from me! If you like General Tso’s chicken, give it a try! Dredge chicken in flour and fry in oil over medium heat (in a wok or a skillet) until golden brown and crispy. Drain excess oil. Sprinkle cayenne over the chicken and keep warm on low heat. Meanwhile, in a saucepan, combine sauce ingredients (sugar, soy sauce, pineapple juice, vinegar, garlic, and ginger) and heat gently. When sauce is smooth and sugar has dissolved, SLOWLY add cornstarch mixture and stir constantly until sauce has thickened to desired thickness. Pour sauce in the wok and stir to coat chicken. Stir in green onion and hot red pepper flakes (optional). Remove from heat and serve with rice. Place rice in fine-mesh strainer set over bowl. Rinse under running water, swishing with hands until water runs clear. Drain thoroughly. Bring rinsed rice, water, and salt to boil in saucepan over medium-high heat. Cook, uncovered, until water level drops below surface of rice and small holes form, about 5 minutes. Reduce heat to low, cover, and cook until rice is tender and water is fully absorbed, about 15 minutes. Serve.